As prophesied the little horn would uproot three horns as it came to power. Here is that story. In 337 AD Constantine the Great died and his two sons rule separately. Constans, who favored Nicene Christianity in Rome, and Constantius II, sympathetic to Arius and Eusebius in Constantinople (Istanbul, Turkey). Sibling rivalry began a series of church councils that changed the map of the empire. 341 Council of Antioch revised the Nicene creed by removing the ‘homousian clause’ which specified that the Father and Son were of the same substance or consubstantial. 343 Synod of Sardica (Sophia, Bulgaria) assigns the bishop of Rome jurisdiction over archbishops. 347 First council of Sirmium (residence of Constantius) opposed Photinus, the homousian bishop there. 350 Constantius becomes sole emperor of east and west. 351 Second council of Sirmium drafted the Sixth Arian Confession. 357 Council of Sirmium III endorsed belief in the Son of God begotten from the unbegotten Father. 359 Council of Rimini (Aruminum), 400 bishops affirmed belief “in one God the Father Almighty” and in “Christ our Lord and God” and added “We believe also in the Holy Spirit” (Socrates Scholasticus Book II, Chapter 41, pp. 221,222). 364 Council of Lampsacus recognized only two divine beings the Father and Son. Liberius in Rome agreed with all three councils which were held under the rule of emperor Constantius II a supporter of the begotten Son belief. The battle lines were drawn and now it would be not only religious but political rulers who would lay down the law. 370 Ulfilas flees persecution to convert the Gothic people in Bulgaria (Sardica) to the begotten Son Christianity. 381 Theodosius calls the first ecumenical council of Constantinople which establishes the “mysterious” Holy Spirit as a separate Third Person of the Trinity ‘proceeding’ from the Father but equal to Him and worthy of worship and adoration despite any scriptural indication to do so. 384 Siricius begins issuing decretals and rules that all married priests be defrocked. 386 Celebration of Christ Mass established to honor birth based on the supposed December 25 winter solstice an already long established festival of Saturnalia. 390 Theodosius the Great, decrees that the Nicene creed is the orthodox Christianity and official state religion of the Empire. Teutonic tribes begin to invade from the north as the Huns, cut off from access to northern Chinese pasturelands by the erection of the Great Wall, move westward putting pressure on the Germans, the Alemanni, then the Arian Goths and Vandals. Visigoths invade Rome in 400 AD. 438 The Theodosian Code legalizes Christian beliefs and empowers the church with corporal punishment of heretics, those who disagree with the Church: confiscating their literature, burning their books, and executing those who conceal them. 440 Leo I the Great, “the real founder of the papacy” maintains that the Pope is Peter's successor, “that the supremacy of the Bishop of Rome over all other bishops was definitely declared. 445 Emperor Valentinian, at Leo’s suggestion, “commanded that all bishops throughout the West should accept as law all that the Bishop of Rome approved, and that any bishop refusing to obey a summons to Rome should be forced to do so by the imperial governor.” p. 266 An Outline History of the World, H.A. Davies, M.A., Fifth Edition, Oxford University Press 1928. 451 Atilla the Hun attacks the Western Empire with an army of 500,000 and nearly reaches Paris, but is defeated by the Romans under Aetius. Attila recuperates and then advances into Italy. Pope Leo saves Rome from plunder by warning Attila not to risk the vengeance of heaven (or the reinforcements coming from Constantinople). Impressed by the Bishop’s sincerity (and because a plague has broken out in his camp), he withdraws his troops and dies the following year. Many begin to look to the Bishop of Rome as their natural protector. But Rome’s troubles are not over. 455 Vandal Carthaginians, lead by Genseric, sail up the Tiber and plunder Rome despite Leo’s pleadings. He does persuade them at least to not burn the city. 476 Western Empire finally came to an end when Odoacer, the most powerful German Gothic general of the Heruli, banished the last Western emperor, Romulus Augustulus, and becomes the first king of Italy. Like the rest of the “barbarians,” he rejected the Trinity doctrine and believed in the only begotten Son of God the Father. Catholic silence regarding Odoacer testifies to his toleration of other faiths. 481 Clovis becomes king of the Franks at age 15. 483 German Gothic ruler Odoacer sends his first lieutenant, Basilius, from Ravenna to Rome to invest the pontiff with the additional titles of eminentissimus (His highest eminence) and sublimis (sublime). 486 Franks under Clovis defeat the Romans at Soissons and govern Gaul to the Pyrenees from Belgium (dark green area in the map above). 489 After a reign of 14 years, Odoacer is defeated by the superior genius of Theodoric, king of the Ostrogoths, who takes Milan as promised by Zeno the Eastern Emperor on Odoacer’s removal. 492 Pope Gelasius I declares that his acts are not to be controlled by the canons of synods, past or present. He maintained that the pope is Peter’s representative or vicar. 493 After five years of fighting, Theodoric invites Odoacer and his sons, to a peace treaty and feast at Ravenna. After agreeing to equal rule in Italy with Theodoric and the Ostrogoths, Odoacer is stabbed and assassinated during the banquet on March 15. The Heruli, First of the three horns was uprooted. Theodoric is proclaimed king of Italy. Theodoric’s reign of 33 years was devoted to civil government. Also a rejecter of the Trinity dogma, he was, however, well aware of the critical importance of the Roman pontiff in determining the stability of his dominion. 496 Clovis king of the Franks is baptized, Anastasius II becomes pope Clovis conquers the Black Forest Alemanni after promising to become a Christian if he could win the battle. After his victory he became a strong political ally for the pope, willing to fight the battles against the “Arian barbarians.” 508 Clovis fights his first battle for the Pope against the Arian Visogoths of Spain. 510 Ennodius, bishop of Pavia, declared that the Roman pontiff was to be judged by God alone, placing him immune to any earthly tribunal. This set the groundwork for the future doctrine of papal infallibility. 514 Hormisdas is pope during which Constantinople published a rigid law ordering the elimination of the Arians through punishment by the church. This created serious resentment within Theodoric and he demanded that his fellow Arians in the East be accorded the same toleration that he had afforded the Catholics within his domain in the West. 523 John I sent to Constantinople by Theordoric to obtain relief for the Arians there. But John is not entirely successful (how could he be? He was doomed either way: alienate Theodoric or Justin). Instead of receiving the recognition he should have as the first pope to visit Constantinople, Theodoric imprisons the bishop on his return in 525 and mandates the prohibition of Catholic worship in the west. Theodoric, after a life of virtue and glory, descended with shame, guilt and paranoia to murder the aged Symmachus but dies himself the following year. The Eastern Empire prospered under Justinian who began to rule the year after Theodoric died (527). He built the church of St. Sophia in Constantinople, founded a university, and codified Roman law. “In 527 Justinian became emperor with the clear aim of reuniting East and West in both politics and religion.” P. 46 A Short History of the Catholic Church, J. Derek Holmes and Bernard W. Bickers, Burnes & Oates, Kent, England 1983. “Justinian I (527-567)…this despotic emperor prohibited heathenism as a form of worship in the empire on pain of death.” P. 29, Vol 3 History of the Christian Church, Philip Schaff (1819-1893). Monk Dionysius Exiguus introduces the use of “A.D.” (anno domini) notation. 530 Boniface II contested by rival pope Dioscorus. 531 Boniface tries to appoint Vigilius as his own successor; a synod annuls it. “The Church and the papacy still suffered under the alien grip of the Arian Ostrogoths who had conquered Italy. A grand effort was made by Justinian, the ruler of the still independent Eastern Roman Empire, to reconquer the western territories. He began with Africa, where his general, Belisarius, quickly overthrew the Vandals and liberated the Catholics.” The Carthagenian Vandals, the Second horn, was now uprooted. “It is reckoned that during the reign of Justinian, Africa lost five millions of inhabitants; thus Arianism was extinguished in that region, not by any enforcement of conformity, but by the extermination of the race which had introduced and professed it.” History of the Christian Church, J.C. Robertson, Vol. 1, p. 521. 535 “Turning toward Italy, he [Belisarius] crossed over to Siciy and soon had Rome under his control.” p. 110 A Concise History of the Catholic Church, Thomas Bokenhotter, Doubleday, 1977. 533 Emperor Justinian in his Justinian Code (Codex Justinianus) declares the Bishop of Rome to have first rank of all pontiffs, head of all Christian churches, and that he (Justinian) would exert every effort to increase the honor and authority of the Apostolic See of Rome. “The Justinian Codex of Laws shows great influence from orthodox christianity; beginning by declaring for the Trinity, it establishes the emperor’s dominion over the Church.” p. 417 Chronology of the Ancient World 10,000 B.C. to A.D. 799, Simon & Schuster 1976. This was the formal transfer of power from the Emperor of Pagan Rome to the Papacy. It should be noted however, the implement-ation of this decree did not actually occur until 538 A.D. Meanwhile, in the West Theodoric had no male heir, so his daughter, Amalasuntha, made her son, prince Athalaric, king of Italy. But as he was only an adolescent, she held power as regent. We he died at age sixteen from the plague in 534, she became queen. 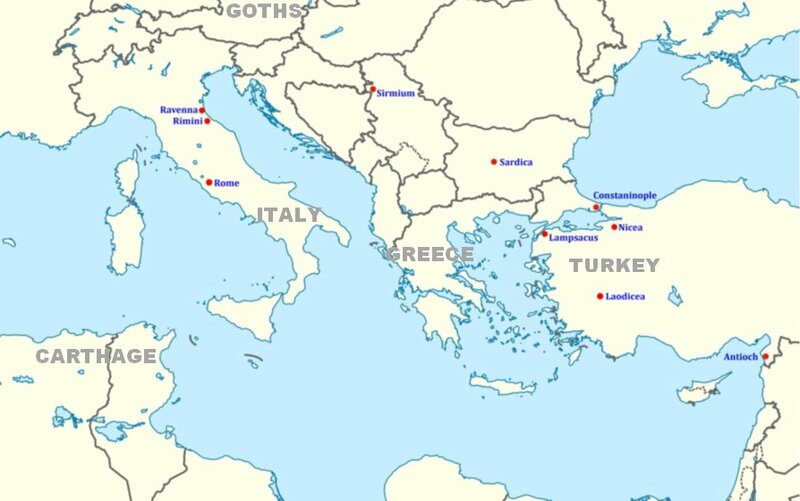 To strengthen her position she decided to share the regal title with one of her Gothic cousins, Theodatus (Theodahad). Her pro-Roman cultural stance made her unpopular within the ranks of the Ostrogoths and sensing intrigue Amalasuntha appealed to Justinian for help. But before help could come Theodatus had her imprisoned and strangled in the Spring of 535 on the pretense that she was responsible for Athalaric’s premature death. This injustice inspired emperor Justinian back in Constantinople to dispatch an army once again to Italy with his general, Belisarius. 535 Agapetus I, the new pope is sent by Theodatus to Constantinople as an emissary on his behalf to appease Justinian. But he dies within a few months. With news of Belisarius’ victories in Sicily and Naples and his approaching Rome, the Ostrogothic army made Witges king and disposed of Theodatus. Witges installed a pro-Gothic pope, Silverius, and moved his troops to Ravenna. 536 When Belisarius arrived in Rome, 150,000 Goths descend and besiege the city for months, threatening to take it. During this time, a letter from Silverius was intercepted by the Roman imperial guards that was en route to the Gothic king stating that the gate adjoining the Lateran church would be secretly opened to allow his Gothic troops access to the city. Pope Silverius was summoned before Belisarius. His wife, Antonina, conducts the inquiry. Accused by credible witnesses and the evidence of his own signature on the intercepted letter, the successor of St. Peter was disrobed of his pontifical ornaments, deposed, clad as a monk, and banished to an island in the East. Deacon Vigilius in Constantinople was sent to Rome as his replacement in 537 but is a mere puppet of Constantinople. With Rome under siege, Witgis blocks the aqueducts feeding the Eternal City, but the plan turns the Ostrogothic encampment into a stinking marsh and breeding ground for malaria. 538 With additional reinforcements arriving from Constantinople in March the Ostragoths suddenly abandon their year-long seige of Rome and retreat to Ravenna. The Third and last horn is uprooted. Released from Arian control, the church was finally free to exercise the prerogatives of Justinian’s 533 decree. “...and the city, after sixty years’ servitude, was delivered from the yoke of the barbarians.” p. 309 Historian’s History Vol 7C. The last of the three Arian powers were finally defeated: Heruli, Vandals, and finally the Ostragoths in 538 A.D. Each of them rejected Catholic teachings and were finally defeated by Emperor Justinian on the Pope’s behalf.